Recently I purchased a very good deal from London to Ecuador through British Airways. For $1100, the return ticket was British Airways First Class from London to Miami, and then American Airlines Business Class from Miami to Quito. While I would have to position myself from Seattle to London in order to take advantage of the sale, I figured it was worth it. As an Alaska MVP Gold 75K crediting to Alaska’s Mileage Plan, I would earn 62,500 redeemable miles, of which nearly 30,000 were elite qualifying. At time of booking, I figured it was likely a fare that British had accidentally posted. It happens from time to time, I flew to Beijing on one such fare. Maybe someone entering the fare data at British forgets a digit. Still, $1100 is a lot of money so I thought it might be some special deal. To bring in even more confusion, the fare was £787 on some days, which seemed like it might be in honor of the delivery of their 25th Boeing 787 aircraft. I booked the fare on Monday night. As always with these types of deals, I wait to book hotels and positioning flights until the dust settles and I know it will stick. I booked through Expedia which gives me 24 hours to cancel. I figured that British would figure it out within 24 hours. When it was 48 hours out from my book, no word from British made me think maybe, just maybe, this would stick. My credit card had been charged and my reservation ticketed. So I booked a hotel (with points, fully refundable) and began to look for positioning flights. Then, this morning I received the following email from British (a little over 60 hours after my booking was made). My favorite was the last line of the email. 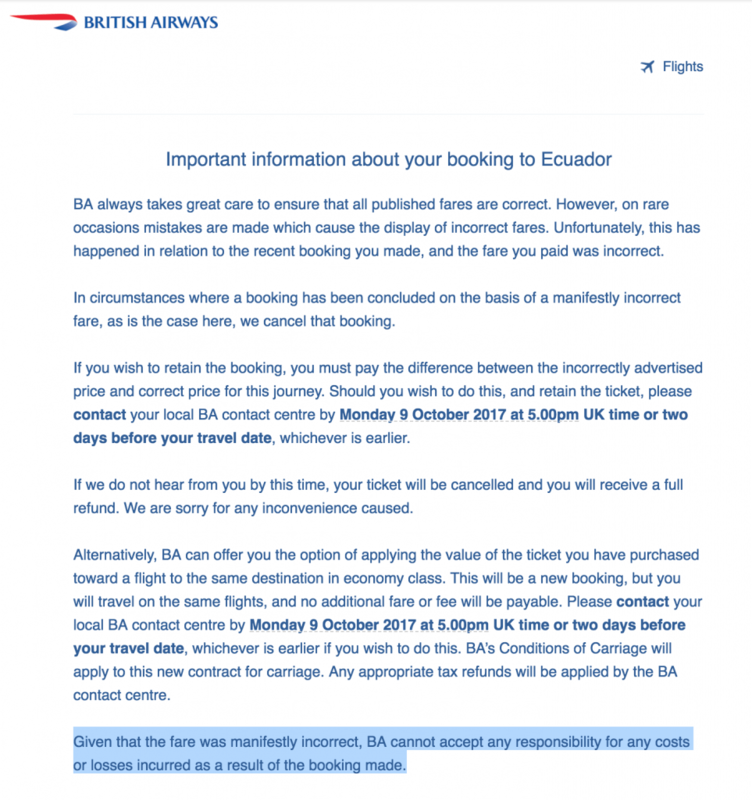 Given that the fare was manifestly incorrect, BA cannot accept any responsibility for any costs or losses incurred as a result of the booking made. So if British can’t accept any responsibility, who is responsible? I also think it is strange it took them 60+ hours to notify me and others that got in on this deal of their ticket cancelation. We as consumers get 24 hours in the US to cancel our flights after booking. Why does the airline get unlimited time to change it’s mind? 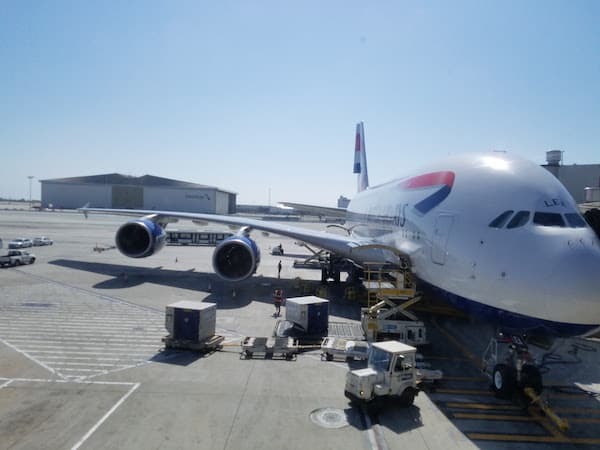 British Airways likely discussed the fare on Tuesday or Wednesday and came to the conclusion that it was in their best interest to cancel these tickets. At the end of the day, I have flown too much and collected miles for far too long to be surprised by British’s action. I knew it would likely get canceled. I’m going to move on and seek out the next good deal. I fly British a good amount. I know a lot of people trash their Business Class but I don’t find it so terrible. However this does leave a bit of a bad taste in my mouth regarding British Airways.